In the quest for a more beautiful smile, many people are interested in finding a teeth whitening dentist. In fact, patient surveys organized by dentistry associations show that as many as 90 percent of people request tooth whitening while at the dentist. White teeth are emblematic of youth and health, and everyone would like more of both. But is teeth whitening safe, is it effective and is it affordable? The answer, fortunately, is yes to all three, but it depends on how the procedure is handled. What about over the counter options? Over the counter products are not custom products – Teeth whitening trays are used by dentists, and some similar versions are available at the store. The difference, though, is that a dentist will fabricate a custom set of trays that fit your teeth perfectly. This is important for comfort and for safety reasons. If the trays do not fit the teeth precisely, some of the whitening agent may come in contact with the gums or other soft tissues. This will likely result in irritation, and the long-term effects of soft tissue exposure to whitening agents aren’t well understood. And if some of the whitening agent is swallowed, it can result in nausea or vomiting. This should explain the importance of a proper fit of the whitening trays. Teeth whitening strips also produce a poor fit, because they aren’t designed to contour to the teeth. The results can be uneven whitening, as parts of the teeth are never properly exposed to the whitening agent. Over the counter products aren’t as powerful – That’s not to say that they won’t whiten teeth, because they can produce results similar to professional whitening. The problem is that because the whitening agent is delivered in a lower concentration, it has to be kept in contact with the teeth longer. At the dentist, a whitening procedure will last about an hour. At home, the whitening strips or trays may need to be kept on for several hours, or even overnight. Comfort and sensitivity can be an issue here. Over the counter products may worsen existing dental health issues – Before a dentist begins any teeth whitening procedure, they will first examine the patient to ensure there are no underlying health problems that could be affected by the procedure. A reputable dentist will never begin teeth whitening before treating conditions like gum disease or cavities. But people using over the counter products will have to begin the treatment without this insight. If there are existing cavities, the whitening process can cause severe, even debilitating pain. It’s far better to be safe than sorry in this regard. Still, whitening teeth at home can be effective for some, but it’s always best to see a dentist before beginning any form of treatment. How the professionals perform teeth whitening? Custom whitening trays – This is the technique that most dentists rely on, and for good reason. The research is clear that custom trays are effective and perfectly safe when used appropriately. The dentist will first image your teeth, and this will be used to create a tray that forms perfectly around them. A tight fit promotes better contact with the whitening agent and ensures no other tissues are involved. Patients will take the trays home with them and continue the treatment there, and after a few visits to the dentist to expedite the process, the patient is done. Dentists can use more powerful peroxide gels than what’s found in over the counter products, and this will shorten the time it takes to get the teeth whiter. Most patients prefer whitening trays as the cost involved is easily manageable, especially when compared to other forms of treatment. But, it is important to use the trays as directed. Leaving them on too long can damage and increase sensitivity. And the effects are not permanent (no form of teeth whitening is), as staining and age will contribute to future yellowing. If consistent whitening is desired, patients may need to see their dentist every six months, though some will only need a touchup every couple of years. It depends on the patient and a number of other factors, including smoking, drinking coffee and tea, and enjoying red wine. Light-accelerated whitening – During this procedure, a high-concentration peroxide gel is applied directly to the teeth. A light is then applied to the gel, and this speeds up the chemical reaction that allows for whitening. A protective cover is placed over the gums to keep them shielded from the light. There is one significant benefit to this approach: speed. If rapid whitening is needed, say for an upcoming event, then nothing will whiten the teeth faster than this approach. 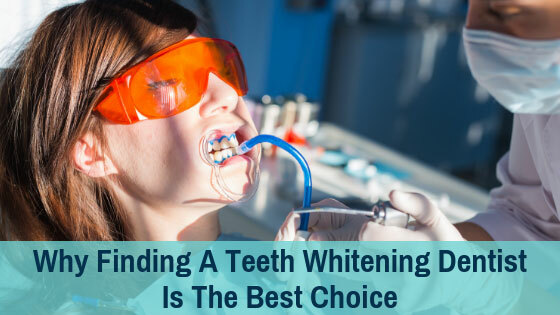 However, light-accelerated whitening will not ultimately produce whiter teeth than what trays can manage. Although it’s important to note that some dentists believe that accelerating the chemical reaction might damage the teeth, resulting in early yellowing. Laser, LED or halogen whitening – This is the most controversial option of the three, and many dentists will not even consider the procedure. To date, research strongly suggests that laser whitening is not effective and can actually cause damage to nerve tissue supporting the tooth. Patients are promised rapid whitening after just a single session or two, but the results don’t always match the claims, and the possible safety issues are something to consider. Further, laser, LED and halogen whitening is expensive. The procedure can cost $1,000 or more. Teeth whitening is a booming industry in the dentistry field, so make sure you have a dentist you can trust before considering it. A reputable dentist will consider your overall oral health before proceeding, and will only use proven methods that come with a minimal likelihood of harm. © 2017 Dorothy Paul, DDS. All rights reserved.